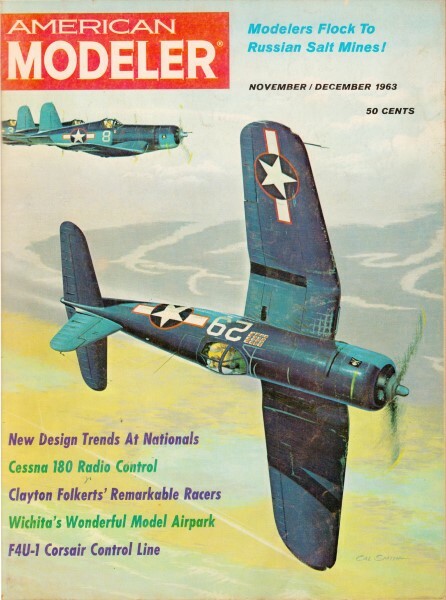 If you are a fan of airplane racing, then you are likely familiar with Clayton Folkerts, an early speed demon of the air. Starting in the early 1920s with a 27-hp engine and a homebrew airframe and hand-carved propeller, Clayton and his brothers made a name for themselves in the history books. When you have a Wikipedia page about you and it's not because of an infamous crime you committed, you've done something noteworthy ;-) This story from a 1963 edition of Americana Modeler is chock full of photos and an extensive textual treatise on the Folkerts' accomplishments. You wonder how he could be happy down on the farm after masterminding construction of America's hottest little racing planes. Quite a designer! Folkert's SK-4 in 1938 with Roger Don Rae at the controls. First Monocoupe, built in 1927. Second Monocoupe made, original in background (1927). Velie trio: Buggy, Automobile and Velie-Powered Monocoupe (1928). Vern Roberts and his "Little Sweetheart" Monocoupe (1929). Clayton Folkerts and the Mono-Special in 1929. John Livingston and his Modified Short-Wing Monocoupe (1932). Folkerts Special (modified Mono-Special) at 1933 American Air Races. Harold Neumann's SK-2 just after completion in 1936. Rudy Kling's Folkert's "Juniper" SK-3 (1937). The Folkerts SK-4 as it appeared 1938-9. On a beautiful secluded hilltop near Iowa Falls, Iowa, lives one of the top speed plane designers of all time - Clayton Folkerts, a humble, unassuming gentleman. He and his wife Florence live a very quiet life as compared to the speedy days of the 30's and the National Air Races. Clayton was born on November 9, 1897 at Wellsburg, Iowa. His parents Atho and Johanna Voss Folkerts had seven sons. It was near here that Clayton and his brothers built their first airplane, a high wing affair powered by a two-cylinder Indian motorcycle engine. All parts of the plane were hand built and the propeller was hand carved from spruce. Completed in 1918 this monoplane never flew very high or very far, but did get into the air. Folkerts' next venture was in 1921. This was also a monoplane but its powerplant was a Model T Ford engine; she flew quite well. In 1923 Clayton started to hit his stride. He had acquired a 27-hp Lawrence engine (forerunner of the Curtiss) and built a biplane around it. During this same period his brothers were busy making a propeller-driven auto. Clayton decided that they might be able to get funds for their projects via the Butler County Fair. He borrowed his Mother's sewing machine and made a 20x26' tent. This was set-up on the Fair Grounds and housed the airplane; the car was parked outside. The Folkerts boys would start the car and airplane engines to attract a crowd. Then they would sell tickets to see the plane or for a ride in the prop-driven auto. Although this venture netted only enough to pay for the tent, all agreed that the fun and excitement were worth all the work. In 1926 Clayton Folkerts teamed up with the Miller-Palmer Company of Dubuque, Iowa. This organization formed the Central States Aero Company which later became the Mono-Aircraft Company. This was the beginning of the famous Monocoupe airplane that became known the world over for its speed and stunting ability. Clayton designed the first Monocoupe which was built in Bettendorf, Iowa. In fact the first Monocoupe and the first production models were made in the Bettendorf Tabernacle located on Wallace Field. W. L. Velie of the Velie Motor Car Co., one of the early backers of the aircraft firm, became President of Mono-Aircraft. Mr. Velie who had built horse buggies and autos had developed an aircraft engine for the Monocoupe. The operation continued to grow and Clayton continued to improve on the design of the Monocoupe. After three years of operations at Bettendorf the company moved to Moline, Illinois. By this time the Monocoupe had become known as the fastest plane in its class, faster than many more powerful planes. 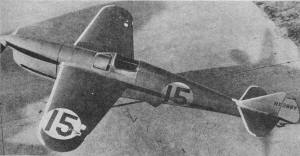 During the early 30's many famous racing pilots flew Monocoupes in competition with specially designed racing aircraft. Such famous pilots as Johnny Livingston, Vern Roberts, Harold Neumann, Stub Quinby, Marcellus King and many others piloted Monocoupes in racing and stunting competition. It was during this period that Clayton Folkerts built his first pure racing airplane. 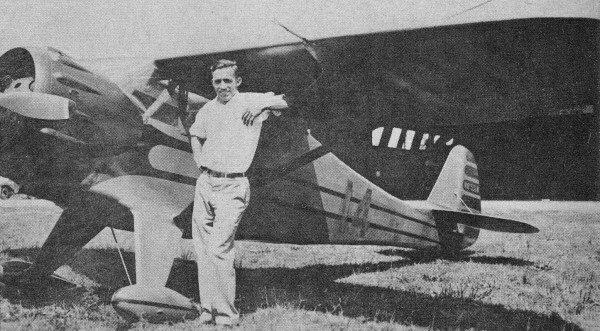 Vern Roberts and Clayton had talked of this racer while the company was known as Central States Aero, but it was not until the American Cirrus Derby Cross Country Race that their dream came true in 1930. 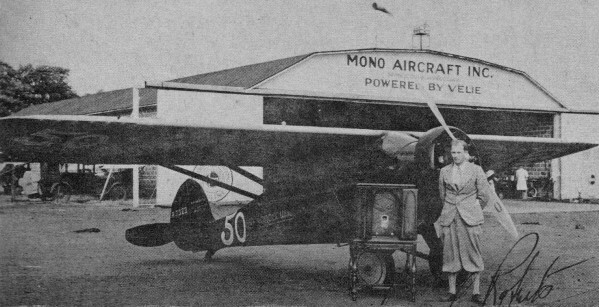 While the plane was built at the expense of the Mono-Aircraft the engine was furnished by Folkerts and Roberts. The end result was a sleek tightly cowled mid-wing called the Mono-Special. Its hand-rubbed bright red finish glistened as the 310 cubic inch 90-hp Cirrus engine pulled the racer through the air. Licensed NR500W the plane carried Number 6 on its flanks for the Cirrus Race. Johnny Livingston and Vern Roberts had done preliminary test work on the racer and Johnny was to fly it in the race. Livingston became ill and was unable to make the race so Monocoupe Test Pilot Stub Quinby slid into the cockpit. Stub did a fine job an was in second place when the contenders arrived at Douglas, Arizona. But the craft was stiff-geared and as Stub set her down on the rough field, the little bomb nosed over and was out of the race. Later that same same year, after she had been repaired, Stub raced the Mono-Special at Omaha. In 1931 he again raced with it at Omaha, doing quite well both seasons. After the 1931 races, Folkerts shipped the plane to St. Louis where it remained until 1933. Prior to the 1933 American Air Races at Chicago Folkerts hauled the Mono-Special to Moline for a face lifting. The wings were shortened by 4' and one of her four longerons was removed, slimming the fuselage from the cockpit rearward to the tail. The cockpit ended up 30'" wide and 40" deep. Chet Loose, another race plane designer, helped with a new cowl and a set of midget wheel pants. Folkerts had planned a retractable gear for the racer but time did not permit him to perfect it. So the retractable gear was cut off and a complete new gear built. The racer was now the "Folkerts Special." Later it was commonly but incorrectly labeled the Folkerts SK-1, since the Folkerts SK-2, 3, and 4 followed. Harold Neumann tested the Folkerts Special and then flew it from Moline to Chicago. During the American Air Races Harold pushed the little red No. 12 racer around the pylons at 170.81 miles an hour, winning both 350 cubic inch races and picking up the Edelweiss and Hotel Sherman Trophies. He also placed third in the 500 cubic inch Aero Digest Trophy Race. During the same meet Marcellus King took a turn with the racer and placed fifth in the 500 cubic inch Baby Ruth Trophy Race. Later the same year, also in Chicago, the International Air Races were held. Roy Liggett and Russ Hosler took over the cockpit duties for these battles. They picked up two 4ths and a 5th. The only changes that had been made to the racer was the race number, 4 replacing 12. The following year (1934) Folkerts sent Neumann to the Pan American Races at New Orleans. It was during these races that two lady enthusiasts nicknamed the racer "Matilda." No sooner had they suggested the name than it was painted on the cowl. Matilda performed well in the lower cubic inch events, pleasing Clayton and Harold ­ and the ladies. In 1935 the Folkerts Special was sold to Fordon-Neumann Air Shows. The racer was again modified, but still retained the 90 horsepower engine. It was used for air shows throughout the Midwest and South and appeared at the 1935 Nationals, turning the pylons at 187.65 miles an hour. The racer was later sold to Clem Whittenbeck and appeared for the last time at the 1937 National Air Races. Even at this late date the seven year old job picked up third and fourth spots. The Monocoupe factory in early 1932, after the death of Velie Sr. and Jr., had been purchased by Phil Ball, owner of the St. Louis Browns baseball team. The plant moved to St. Louis. By this time many different engines were being used in many different type Monocoupes, such as the Mono-Prep, Mono-Sport, and Mono-Coach. Hundreds of Sports/Private pilots were using these planes, and many were employed commercially. Folkerts worked with the company until 1935, designing and engineering new and ever faster Monocoupes. Then he went to work for Waco Aircraft in Troy, Ohio, during late 1935 and early 1936. When the speed bug really bit him he quit Waco to build his second racing craft in Waterloo, Iowa at the Canfield Airport. Stress analysis was performed by Fred Knack of Douglas Aircraft. The lights of Doug Harris' hangar burned late every night as Clayton pushed to get his. racer finished. Then one sunshiny morning the hangar doors opened and out rolled a sleek bright yellow mid-wing racer. It was powered by a four cylinder supercharged 363 cubic inch "Pirate" Menasco C4S engine, rated at 185-hp. The cantilever type mid-wing had cantilevered control surfaces, fully retractable landing gear and trailing edge wing flaps. Fuselage was steel tubing with wood fairing, Irish linen covered. The monospar wing had a spruce I-beam spar and plywood covering. Flaps and ailerons were plywood covered; rudder, fin and elevators were fabric covered. The propeller was a Fahlin product of relatively low diameter and high pitch. A rounded spinner housed the prop hub; the shaft had been lengthened about one foot to permit better streamlining of the cowl. The landing gear, semi-cantilevered, presented low drag when extended, permitting quick take-offs. It was equipped with shock cord absorption for smooth landings which were quite different from the dangerous hopping and bouncing of the stiffer geared racers. This gear was also rigged to "walk" forward and backward. This aided the pilot in directional control during takeoffs and landings and smoothed out rough spots on the landing field. Landing shocks were further lessened by Goodrich low pressure tires. The retractable gear was operated by two controls. One, located on the left side of the fuselage, actuated the up and down locks and the other, a wheel set at a 90 degree angle from the pilot and hung down under the instrument panel, operated the gear itself. It all worked with very little effort on the part of the pilot since it was aided by air pressure while being retracted, and the weight balanced out the air pressure when extending. In event of gear failure the belly of the racer was reinforced for skid landings. Flaps operated by a lever control and contributed to both lift and drag when in the down position. Fresh air was supplied to the cockpit through a rubber hose extending from the forward point of the windshield with its intake point well ahead of any possibly contaminated air. Wing span was 16 feet, length 19 feet 6 inches, height 5 feet 3 inches, wing area 50 sq ft, weight 700 pounds empty and 1,000 pounds loaded - giving the racer a wing loading of 20-lbs/sq ft. This racer was hauled to Kansas City and there tested by Harold Neumann. After the test hops were successful she was prepared for the 1936 National Air Races. The ship was designated the Folkerts SK-2 (SK-Speed King) and given the name "Toots". The yellow fuselage was trimmed with brown, license number R-283Y was painted on the rudder and wings, "Toots" on the cowl, and race number 1 added to fuselage and wings. The Folkerts SK-2 made a big impression at the '36 Nationals. With Harold Neumann at her controls the little racer picked up three firsts, two seconds, and one fourth place. Between each event it appeared that Clayton was completely rebuilding the racer, but she was always ready in time for the next dash. Steve Wittman took her over the 550 c/i Free-for-All, a fifty mile race. During this event the gasoline tank ruptured and covered Steve with fuel. But Steve kept the throttle wide open and finished second. Fastest time around the pylons for the SK-2 was Neumann's fourth spot in the Thompson Trophy Race. He turned this at 233.074 miles an hour. Later the same year Roger Don Rae took "Toots" to the Detroit Air Races. At this show he won all four of the feature events. 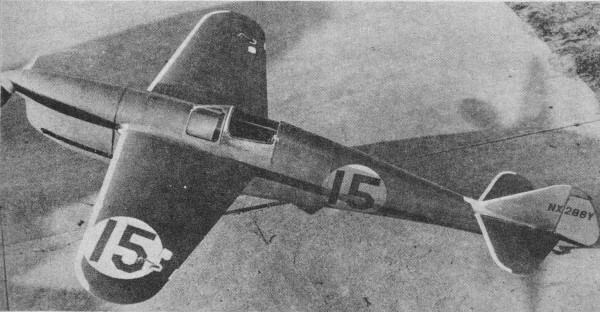 Prior to the 1937 St. Louis Races Folkerts sold the SK-2 to the Forden-Brown Air Shows. Clayton's brother delivered the racer via trailer to Kansas City. Fordon-Brown placed a new prop on the racer and failed to tighten a hub bolt. This was to cause trouble later. The racer was hauled to St. Louis and put together. Roger Don Rae was again the pilot. Early in the races, one prop blade departed and Roger had to make a crash landing. While the ship was badly damaged it was not a complete loss and Rae was not hurt seriously. Folkerts again stepped into the picture. He took the racer to Lockport (Holy Name Aviation) where he and the students rebuilt the ship. No modifications were made on the racer; only thing changed was the paint job, which now was red and black. The racer appeared at the 1937 Nationals in these colors and with the name "Miss Detroit'" on the cowl. Roger Rae picked up three second places and one fourth during these races, his best pylon speed was 242.68 miles an hour. In a few of the events, three Folkerts speed jobs were competing. These were "Matilda", "Miss Detroit", and the new Folkerts SK-3. Early in 1938 the SK-2 was again modified. Its fuselage was covered with metal to just aft of the cockpit and a few other minor changes had been made. The racer was now named the "Foo". This name appeared on the cowl and a new race number 11 was painted on its fuselage. Gus Gotch was the pilot for the 1938 Oakland Air Races and met with disaster and death when he spun in on a pylon turn. The racer was destroyed. A new and larger Folkerts appeared at the 1937 St. Louis Races. This was built in Lemont, Illinois. This one was built for Rudy King who operated a garage there. Rudy had demolished the Keith Rider "Suzy" at the 1936 Nationals and was after a new racing mount; the Folkerts SK-3 was named "Jupiter, Pride of Lemont". The racer was hauled to St. Louis and assembled there. Its lines were similar to the SK-2 but it was a bit larger. The powerplant was a six cylinder Menasco "Buccaneer" C-6S4 of 544 cubic inch displacement. Wing span was 16 feet 8 inches, length 21 feet, gear tread 5 feet, height 4 feet, wing area 51 sq ft, empty weight 840 pounds, loaded weight 1385 pounds, and wing loading 27.5. The wing spar extended from wing tip to wing tip, passing through the just ahead of the pilot and slightly above the fuselage axis lines. It was equipped with four fuel tanks - two were 11-gal, main 27-gal, an auxiliary tank behind the cockpit held 12-gal for a total of 61 gallons of fuel. The 11 gallon oil tank was aft of the cockpit and long pipes were installed along the longerons to aid in cooling the oil. The racer was yellow cream trimmed in red. It was licensed R-14899 and carried race number 301. It was a picture of speed, a beautiful plane in anyone's book. 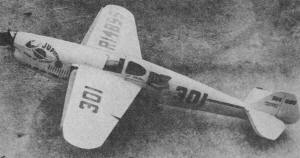 Roger Don Rae test flew the plane at the 1937 St. Louis races. With its special Folkerts gear and a landing speed of 63 miles an hour Roger found the racer very easy to fly. After the test flight Rudy Kling with only 150 flying hours took his turn with the racer. Rudy's lack of stick time didn't appear to make any difference at the 1937 National Air Races. Kling started off by qualifying first in the 550 c/i Greve trials at 223.10-mph and then flew a great race to win the Greve Trophy at 232.27 miles per hour. He qualified fifth for the unlimited Thompson Trophy Race but was determined to beat that spot. Some of the breaks fell Rudy's way and the others he made himself. Wittman had a commanding lead over all contenders when his Curtiss D-12 ran out of vitamins. He had to slow down after leading the field for 17 laps. This put Turner out in front until he cut a pylon and returned to circle it. Now Earl Ortman and the powerful Rider R-3 was ahead. For 19 laps a thundering herd of powerful "Clydesdales" had been galloping around the track, followed by a "Shetland pony" ridden by Rudy Kling, who had passed by time after time almost unnoticed. It was the final lap and near the finish line Ortman throttled back but no Rudy! He came on full throttle and dived ahead of the big R-3. The Folkerts SK-3 had beaten the big racers in the Thompson Trophy Race. Rudy's speed was 256.91 miles an hour and Ortman's 256.89 making it the closest Thompson Race in history. Kling was also the only American pilot to win both the Thompson and Greve Trophy Races the same year with the same racer. Rudy took the "Jupiter" to the 1938 Miami Races and was again running second when he attempted to dive below one of the large racers. This time the results were not the same. Rudy and the SK-3 hit the prop wash from the larger racer, the little Folkerts did a half snap and plunged to the ground. Kling was killed and the plane completely destroyed. Knowing that the accident was not because of any fault of the plane Folkerts built a fourth ship for the 1938 National Air Races. This was the SK-4, almost a twin to the SK-3. Even the engine was the same. 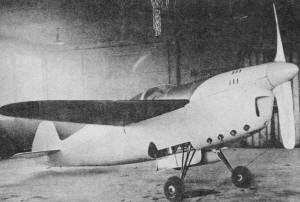 However, the SK-4 was fitted with a Fahlen aluminum redesigned J-5 propeller in place of the wood type on the SK-3. This racer was painted a bright red, licensed R-288Y and given race number 15. It was built for Joe Jacobson who flew the first test hop and one other flight, but was unable to handle the bomb. So - Folkerts once again called upon Roger Don Rae to finish the test flights. On Rae's first hop he attempted a high speed run during which the racer developed a terrific wing flutter. Not only the tip but the complete wing fluttered. The noise could be heard from the ground and Folkerts wondered if Roger would get the racer on the ground safely or bail out. The flutter tore all the aileron cables off the pulleys and ripped the fittings loose. In the cockpit Rae grabbed the cables in one hand and pulled them up to take out the slack. Then holding the cables and operating the throttle, landing gear, and control stick with the other hand, he fought the racer to the ground and set it down for a perfect landing! These tests were made at Kansas City and the National Races were getting close, so Clayton and Rae worked on the racer in hopes of eliminating the flutter. Then the SK-4 was shipped to Cleveland for the races. During trial flights at Cleveland the flutter was again experienced so the aircraft did not participate. The SK-4 returned to the 1939 Nationals less its wing flutter. Del Bush was the pilot and Clayton was there to keep his racer groomed. During qualifying runs the Menasco devoured an intake valve and the engine began to run rough. Bush made a pass over the field and was turning back to land when he stalled out. The SK-4 did a complete roll, came out level, then continued on into the ground. Bush was killed and the racer was totaled. It was the end of Folkerts' efforts in the race plane field. In 1940 Clayton married Florence Fontaine of Kansas City and went to work for Waco Aircraft at Troy helping on the design of gliders and trainers for the War effort. He continued there until 1948 when he and his wife moved to their 90 acre farm near Iowa Falls.